We offer well-maintained Biscuit Making Machinery. The Biscuit Making Plant that we deal in is sourced from trusted firms that guarantee its reliability. Our Used Biscuit Plant is tested on several parameters by our experts so as to ensure its high efficiency. We have been able to position ourselves as one of the chief Suppliers of Biscuit Making Machinery in India. With our rich expertise, we are engaged in offering a wide range of Biscuit Manufacturing Equipment to our clients. These are acknowledged for longer service life and sturdy construction. The equipment comprises 3 Roll Pre Sheeter, Gauge Roll and Vertical Dough Sheeter, which is used for different purposes for baking biscuits. 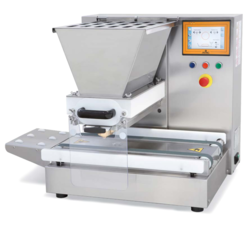 The Fully Automatic Wafer Biscuit Oven -this is are compact in terms of space requirement with Horizontal Banking Plates of 350 x 500 mm size. The Compact are best suitable for making flat wafers in large scale. These overs supplied with 48 and 60 baking plates mounted lengthwise. For the total patron satisfaction, we provide them properly working Biscuit Baking Oven. This Biscuit Baking Oven is extensively used to bake the biscuits and other bakery items. One also adjusts temperature in this technically advanced Biscuit Baking Oven. 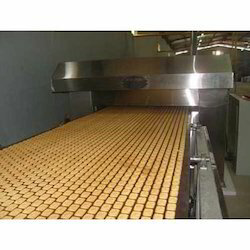 Roll Print Biscuit From Machine is the main machine for the biscuit production line. It will convey the mixed / processed dough to the mould machine, then after mixing into a dough, then baking though the oven to get , a loose , delicious crispy biscuit which is well welcomed by the consumers. Specifications (L x Diameter) : 8.5" x 2" approx.